A close-up of the photo (click on the photo to enlarge it) does not reveal the all-important race number on either the radiator or hood. But, key identifying features include; the logo on the radiator, the distinctive radiator design, the rectangular-shaped gas tank and the unusal alignment of the four exhaust pipes. A review of the 17 cars that started the 1906 Vanderbilt Cup Race did not reveal a match. However, a check of the 16 cars that entered the 1906 American Elimination Trial did point to one possible car...the #15 B-L-M racer. The initials for the B.L.M. stood for the three owners of the company founded in 1906, Sidney Breese, Charles Lawrence and Andrew Moulton. Their initial idea was a race car based on an experiemental model put together by Breese and Lawrence in 1905. 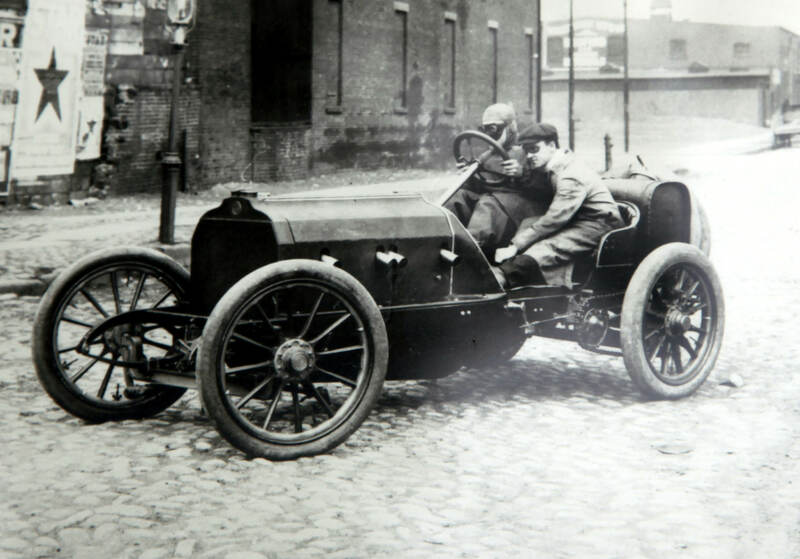 It had 4-cylinders and 85 HP and was built to qualify for the 1906 Vanderbilt Cup Race. As seen here, the gas tank and hood design matched the car in Marie's photo. But, what about the distinctive exhuast side? Eureka! 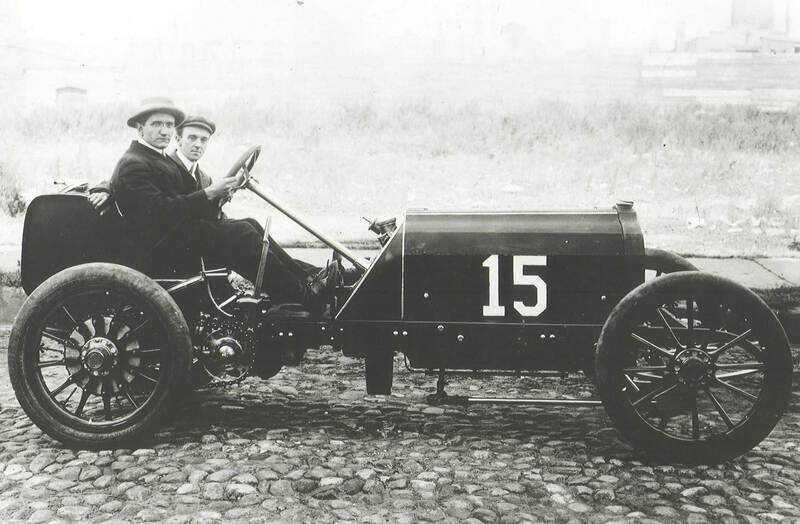 As seen by the placement of the four exhaust pipes, the racer in Marie's photo was the #15 B.L.M. that was entered by Sidney Breese in the 1906 American Elimination Trial. Unfortunately, the B.L.M. never raced in either the American Elimination Race or the Vanderbilt Cup Race. While being driven on race day to the Westbury starting line, the car broke a cylinder and would not start. Despite the disappointment, the car was written up in the October 18, 1906 issue of The Automobile in this article "The Elimination Car That Did Not Start". Thank you, Howard, The report on my picture was more than I expected! My Husband, Bob, is excited! He told me to tell you “this car is in our garage” JUST KIDDING! Doesn’t he wish! Anyway, your research is very interesting and very satisfying, as we have had the photo for about 25 years. Thanks so much again. In case you haven’t made the connection, a regular participant in LIOCC meets in the ‘50s-‘60s was a Bobby Breese, presumably the son of Sidney, driving a later BLM (at least that’s what he called it). I’m fairly sure he’s in your film of the VCR centennial at the Mineola fairgrounds. As I recall it was an unpainted (bare aluminum?) two-seater, quite streamlined for it’s age (late teens?) with red wheels. I’ll bet Wally McCarthy knows what became of it. Always a pleasure to hear from you. Thanks for the connection! The “Breese of Paris” is still running and owned by Michael Sperrazza of Appomattox, Virginia. I’m the owner of the 2 breese Paris autos. & that is without dout the BLM. It was planed to go into production with a number of different bodies Built in NJ with FRench engines. The 1906 recession put an end to production. also there were 2 James Breeses: the father & son. There were 4 males in the family; James Breese the father, Sidney Breese oldest son (designer of the engine for the Spirt of St Louis), James Breese (chief engineer of the NC4 first aircraft to fly across the atlantic around 1919) & Robert Breese (the designer & builder of the Breese Paris).